From 30 August to 10 September the blues guitarist from Texas Jonn Del Toro Richardson will be touring the Czech Republic. One of his performances will take place in South Moravia – 2 September in the Strážničan House of Culture in Strážnice. Further concerts will take place for example on 30 August in Valašské Meziříčí, and 7 and 10 September in Ostrava. 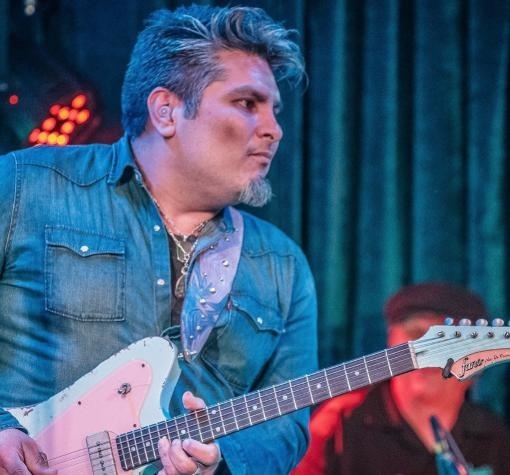 Jonn Del Toro Richardson has so far released only one solo album (a second is in preparation for 2019), but as a much sought after studio and concert guitarist he has worked with many of the top blues performers. You have worked with many important figures from American blues. For example you accompany the pianist Pinetop Perkins on the album The Last of the Mississippi Delta Blues, which was awarded a Grammy. What specifically was important in your cooperation with Perkins? The most important thing Pinetop taught me was that in a concert I must always fully concentrate on my performance. I first worked with him as leader of the group with which Diunna Greenleaf sang. At that time I was responsible for all the technical details of the performance and my head was full of how to make it all go well. I concentrated on the performances of the other musicians more than on my own. Along came Pinetop, he sat at the piano, played the first note and a light came on for me. I had in front of me all the music I had to play and I became aware that as a guitarist I had to concentrate primarily on my own performance. At that moment he looked over at me and smiled. That was our first joint concert. Yes, our last joint appearance took place some six to eight months before his death. We played with Willie Big Eyes Smith on harmonica, Hubert Sumlin on guitar, Bob Stroger on bass and Pinetop on keyboards. I can’t remember the drummer but he was a master. After the first part of the concert I had the impression that Pinetop was not feeling well and that he would not manage the second half. I told the audience when I introduced the band the he was indisposed and that after the break he would not be playing with us. Only when we came back on stage after the break, Pinetop was sitting at the keyboard ready for the next part. He taught me that I always have to be prepared, And that someone is never so ill that they cannot finish a concert. Another interesting cooperation was with the mandolin player Rich DelGross. Is it demanding to combine mandolin and guitar as the main instruments in the blues genre? Working with Rich was great fun. He is the best blues mandolin player in the United States, and in my view in the world. I like the mandolin in country and in folk, it is one of my favourite instruments and it has great possibilities in blues. Combining mandolin or mandola with the guitar was no great problem. In some songs I used a capotasto, and in places we had to agree on the right tuning, but generally working together was truly enriching. It also helped me in my beginnings as a composer. It was also a creative partnership – Rich wrote his songs and I mine, and then we put them together. On the other hand Otis Taylor is a top blues player on the banjo, who shows new possibilities of this instrument on his albums. You have also worked with him. Yes and I also learned a lot when playing with Otis Taylor. The so-called trance blues which he plays is an amazing experience – really powerful music. The line-up in which we performed, that is guitar, banjo and bass, was new for me. Playing with us on bass was Otis’ daughter Cassie Taylor, who is also a wonderful player. Her bass also plays the role of as bass drum, while Otis’ banjo also works as a snare. And I was supposed to play the melody above them, but I preferred to favour only the groove and here and there some kind of solo. How did you put together an accompanying group on your first solo album Tengo Blues? My solo disc Tengo Blues was produced by Anson Funderburgh. He put together for me a wonderful band – Nick Connoly plays on keyboards, Nathan Rowe on bass and Wes Star on drums. They are great studio musicians – Wes is a legendary drummer and Nathan is a versatile bass player who plays double bass and bass guitar on my album. And Nick has worked with everyone and has a tremendous musical knowledge. The wind section Texas Horns also plays or us on the album. I like wind instruments and knew I wanted to have them on the album, but I did not realise that they would play such an important role. However, while we were recording in many songs we said that the winds could be included. In the end you can hear them in seven pieces out of thirteen, which is more than half of the album. I come from Houston in Texas and wind instruments are an inseparable part of the music scene there. How did your Texas, or more specifically Houston, scene arise? I see it as my great good fortune that I come from Houston. It is a city with a long and rich history of music in various genres – blues, country, Latin American and jazz. Many great musicians have sought players from Houston. For example the members of B. B. King’s group are from there. These people had the chance to work with him in the studio and then to travel all around the world. When they then returned home from touring, we grew up alongside them, alongside the best musicians in the world. Many of them have now departed, which is of course sad, but blues is still alive in Houston and doing well. And I am glad that I am part of that world and I had the luck that many of these giants helped me on my way. For example I had the chance to get to know Earl Gilliam shortly before he died. This was someone who had played with almost everyone – with Johnny Copeland, with Albertem Collins and with Albert King. Another who helped me a great deal was Jimmy Louisiana Dotson. As his nickname suggests he came from Louisiana and was the most capable blues guitarist who ever lived. From him I learned to work with chords and rhythm and also how to really listen. You have received several important awards. In the course of the International Blues Challenge you received the Albert King Prize and for the album Tengo Blues you have a prestigious Blues Music Award in the category Best New Artist. How important are these prizes for you? If you win some kind of prize it is in first place a great honour. Someone appreciates your work. In the given moment such an award means a great deal for me, but on the other hand I try not to take it too seriously. Even if I am truly grateful for each prize – and each is a surprise for me – the important thing is what I am doing now and not what worked for me in the past. Currently you are to give several concerts here in the Czech Republic. What can the fans look forward to? I can’t wait to be in Europe again and to play for you. I have lots of original works from which I will be choosing. I try to make each concert different. I watch the audience and try to react in a way that they will like. It also depends on how I and my colleagues feel in the moment. I will be playing my own pieces but there will certainly also be some covers. But we will certainly have fun. Come and listen to us.